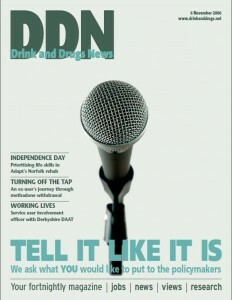 In this issue: Two years ago we started Drink and Drugs News to provide information to the drug and alcohol field. We’d like to take this opportunity to thank our partners for their support and contributions – and to thank all our advertisers over the past two years. Every advert you place funds the production of the magazine and keeps it free of charge. And of course huge thanks to readers for all your much valued correspondence, feedback and encouragement.